The skillful structure of Bible prophecy has been largely ignored. Artistic craftsmanship, while adding force and beauty to the prophecies, also helps cloak God's message from the careless and disobedient. Sometimes menacing, sometimes sublime — yet always vivid and arresting — Bible prophecy speaks to all of us across the centuries. The eternal God of Israel, Himself an author (Hebrews 5:9), so stamped His prophets with His message that in His hands they became powerful, eloquent instruments (II Peter 1:21). "A lion has roared! Who will not fear?" cried Amos. "The Lord God has spoken! Who can but prophesy?" (Amos 3:8). Some passages of Bible prophecy are, like Lincoln's Gettysburg Address, disarmingly simple yet deeply profound. Yet often God inspired His servants to use dramatic, artistic techniques in recording His prophecies, resulting in powerful literature that sealed the messages until God's time for revealing them (Daniel 12:9, I Corinthians 2:7, Revelation 5:3). Sometimes, too, prophetic passages remain a mystery (Revelation 10:7) until certain historic and contextual matters are clarified. "It is the glory of God to conceal a matter," wrote Solomon, the wisest man who ever lived, "but the glory of kings is to search out a matter" (Proverbs 25:2). Armed with this background, let's study seven important principles that help clarify the "living oracles" (Acts 7:38). "And so it is written, 'The first man Adam became a living being.' The last Adam became a life-giving spirit. However, the spiritual is not first, but the natural, and afterward the spiritual." The physical creation is only one phase in God's plan; the spiritual phase comes later and is more significant. So we have the duality principle: Old and New Testaments, Mt. Sinai and the Sermon on the Mount, the "congregation in the wilderness" (Acts 7:38) and the Church of God (I Corinthians 1:2), physical circumcision and circumcision of the heart (Deuteronomy 10:16). Paul even shows that there is duality, at present, in the Godhead (I Corinthians 8:6). Does this principle apply to prophecy? Yes. Isaiah 41:22 states it directly: "Let them show the former things, what they were, that we may consider them, and know the latter end of them." Malachi 4:5 illustrates this point. Malachi predicted that an Elijah-like figure would precede the first appearance of the Messiah; Christ interpreted that this prophecy referred to John the Baptist (Matthew 17:12-13). But notice verses 10 and 11 of Matthew 17: "And His disciples asked Him, saying, 'Why then do the scribes say that Elijah must come first?' Then Jesus answered and said to them, 'Elijah truly is coming first and will restore all things.'" So although John the Baptist was the prior fulfillment of Malachi 4:5, there is to be a latter-day fulfillment in our time! Christ Himself confirmed this duality. Missing this crucial principle leads scholarly theologians to overlook the focal point of prophecy — Matthew 24. Because the brutal Roman armies virtually destroyed Jerusalem in A.D. 70, the scholars think that the prophecy is redundant (Matthew 24:6, 16-21). Not so. For one thing, Christ has not yet visibly appeared, as He promised in verses 29 and 30. Verse 22 is clearly speaking of our time: "And unless those days were shortened, no flesh would be saved." In Hosea 11:1, for example, the nation of Israel stands as a symbol of Jesus Christ Himself: "When Israel was a child, I loved him, and out of Egypt I called My son." Matthew 2:15 applies this verse to the time Joseph and Mary sojourned briefly in Egypt to protect the infant Jesus. Strange? Not if we remember how nations can symbolize people and vice versa ("Uncle Sam," "John Bull"). Winston Churchill personified the "bulldog spirit" of Great Britain in 1940, and many times the nation of Israel personified some of Christ's actions (Isaiah 49:3-6). In the same way, David's agonized cry of "My God, My God, why have You forsaken Me?" (Psalm 22:1) directly foreshadowed Christ's sufferings on the stake. Many of the Psalms reveal David as a type or symbol of the Messiah (verses 6-8, 16-18, Psalm 2:7, 12). This principle clarifies many future prophecies. 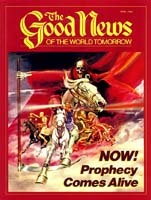 Daniel 11, the longest prophecy in Scripture, time-wise, is a good example. Daniel 11:1-20 surveys various political trends from the sixth century B.C. to the second century B.C. As most commentaries show, however, beginning in verse 21 one figure predominates. This was King Antiochus Epiphanes of the Seleucid Empire in Syria (176 to 163 B.C.). Yet Daniel 11:40 mentions "the time of the end" — the pulsating 20th century in which you and I live. The point is that there is no historical evidence that Antiochus Epiphanes ever fulfilled verses 40 to 45. What he did from 168 to 165 B.C. is remembered by most orthodox Jews to this very day. For more than three years Antiochus forbade the Jews' daily sacrifices in the Temple, and commanded swine's flesh to be offered instead. This was preceded by the slaughter of many of Jerusalem's citizens. Daniel 11:31 refers to this as "the abomination of desolation." Incredibly, though, Jesus Christ warned His disciples: "'Therefore when you see the "abomination of desolation," spoken of by Daniel the prophet, standing in the holy place,' (whoever reads, let him understand), 'then let those who are in Judea flee to the mountains'" (Matthew 24:15-16). Jesus Christ reveals, then, that Antiochus Epiphanes and his despicable actions are only a type or foreshadowing of a still more nefarious event yet to occur in Jerusalem. This makes Daniel 11 the key to prophesied events in the Middle East. Typology thus helps us understand the future (Daniel 12:10). Similarly, in Bible prophecy time measurements are often compressed. It is not unusual for prophecies to span thousands of years, yet be constructed in such a way that they seem limited to one time period. Isaiah 9:6 is an interesting example of the time-lapse method in Bible prophecy. The first phrase in this verse states: "For unto us a Child is born, unto us a Son is given." This is a well-known reference to Jesus Christ's birth in Bethlehem. Now notice the next phrase: "And the government will be upon His shoulder." Incredibly, in just one phrase, Isaiah's prophecy has jumped ahead almost 2,000 years, from Christ's first coming as a humble infant in Bethlehem to His dramatic Second Coming in power and majesty to control the government of this earth (Revelation 11:15). Genesis 40:9-11 is another vivid illustration of this prophetic time-lapse principle. In the butler's dream, the vine thrust forth its blossoms, grapes shot forth and the juice turned instantaneously into wine. Today we would call it time lapse photography. The parable of the 10 virgins (Matthew 25:1-13) epitomizes the history of the true Church of God, for those who understand the symbolism of God's Church as a young virgin (II Corinthians 11:2). The bridegroom in the parable obviously represents Christ Himself (Matthew 9:15). So Matthew 25:5 relates the sorry condition of the true Church following the energetic apostolic era of the first century: "While the bridegroom [Christ] was delayed, they all slumbered and slept." Yes, God's true Church almost disappeared from history! But notice verse 6: "And at midnight a cry was heard: 'Behold, the bridegroom is coming; go out to meet him.'" Now the prophecy has jumped ahead to our day! After a lapse of 1,900 years, the Church of God is taking on new life, reinvigorated to announce that the Bridegroom, Christ, is soon to appear at the wedding supper (Revelation 19:7-9). Take Daniel 2, for example. Here Daniel explains to King Nebuchadnezzar of ancient Babylon the meaning of a resplendent metal image about which the king had dreamed. The head was gold, the breast and arms silver, the belly and thighs brass (verse 32). These symbols are interpreted for us in verse 38: "You [Nebuchadnezzar and the Babylonian Empire] are this head of gold." How clear! Here we see the Bible interpreting itself. Verse 39: "But after you shall arise another kingdom inferior to yours; then another, a third kingdom of bronze, which shall rule over all the earth." Most historians record this clear progression of empires from the sixth century B.C. onward: Chaldean-Babylonian Empire (625 to 538 B.C. ), Medo-Persian Empire (538 to 330 B.C. ), Greco-Macedonian Empire (333 to 31 B.C.). This historic sequence sets the stage for vital end-time prophecies. How? Because Daniel lists no other empire after the fourth. The fourth system must thus hold sway until the end time and be readily identifiable today — and it is … History proves it. The 10 toes are to be smashed by Christ, the Rock (Daniel 2:34, I Peter 2:8), and sure enough, Revelation 17:12-14 shows the "Lamb" (the prophetic code word for Christ) destroying a group of 10 nations at His return. Clearly, the availability of historical records to help us plot out how far we have come in prophecy is part of the knowledge explosion predicted for these last days (Daniel 12:4). History is a useful tool that helps bring us up to date and lets us know how far we have come in God's plan. "Here a little, there a little"
"Whom will he teach knowledge? And whom will he make to understand the message? Those just weaned from milk? Those just drawn from the breasts? For precept must be upon precept, precept upon precept, line upon line, line upon line, here a little, there a little." Jesus said to "search the Scriptures" (John 5:39), an activity for which the Bereans were commended (Acts 17:10-11). The point is that it is wise to survey all the particular prophecies bearing on a subject instead of rushing in with a snap judgment or some instant pet interpretation (II Peter 1:20). Not grasping this principle, some interpreters have created theological quagmires in the "beast chapters," Revelation 13 and 17. Speculation abounds! Pseudoscholars have authoritatively elected Germany as the leopard, Russia as the bear and Great Britain as the lion. Why is this erroneous? Let the Bible interpret the Bible. The symbols of the leopard, bear and lion are presented in another beast chapter — Daniel 7. Yet Daniel 7 is amplified by Daniel 2, where the four great gentile empires are outlined, beginning with Babylon (Daniel 2:32, 38) and following through to Persia, Greece and Rome (Daniel 2:39-40). Thus the composite beast of Revelation 13 and 17 is a code that can be cracked by the "here a little, there a little" principle. Approaching Hebrew thought patterns of 2,500 years ago sometimes presents problems for modern readers. A scientific age such as ours looks for precision in literature. Extraneous material is often deleted to fit the time constraints of today's reader. Logic is paramount. "Wherever you go, I will go; and wherever you lodge, I will lodge; your people shall be my people, and your God, my God." This emotional intensity has survived more than 3,000 years of transmission and helped make the King James Bible a masterpiece of English literature. Yet this very emotional richness and figurative dramatic force pose problems for more literal-minded, rational moderns. To most people today, for example, poetry consists of rhyming sounds: "Poems are' made by fools like me, but only God can make a tree." "Can the Ethiopian change his skin or the leopard its spots?" (Jeremiah 13:23). "The voice of one crying in the wilderness" (Isaiah 40:3). "But everyone shall sit under his vine and under his fig tree" (Micah 4:4). "Can two walk together, unless they are agreed?" (Amos 3:3). One example of this skillful thought pattern is Psalm 1:1, where three of the most common activities of everyday life — walking, standing and sitting — portray the total effect of a life devoted to God. "'If it had not been the Lord who was on our side,' let Israel now say — 'If it had not been the Lord who was on our side, when men rose up against us.'" Prophetic passages abound with these poetic devices. Amos' elegantly organized "for three transgressions … and for four" (Amos 1:3, 6, 9, 13) masterfully subdivides his message into a wave-like pattern that listeners and readers can more easily assimilate. Joel's ingenious reversal of Isaiah's colorful "they shall beat their swords into plowshares, and their spears into pruning hooks" (Isaiah 2:4) is an adept attention getter (Joel 3:10). These literary devices enhance the weight and force of God's message to man. Yet they can also hide that message from those who look for excuses to turn their backs on God (Isaiah 6:10, Matthew 11:25). Daniel 9:26-27 is a pertinent example. Here the prophet has arranged two separate themes in "layer-cake" style — A, B, A, B. This is a common device in symphonies to this day. Especially in classical music, listeners are familiar with major or minor themes becoming alternated, restated and recapitulated. Notice the first thought (A) in Daniel 9:26: "And after the sixty-two weeks Messiah shall be cut off, but not for Himself." "Then he [the Messiah] shall confirm a covenant with many for one week; but in the middle of the week he shall bring an end to sacrifice and offering." Not grasping the poetic structure here has caused some interpreters to force thought B ("the people of the prince who is to come") in verse 26 together with thought A. They have tried to make the prince who destroys Jerusalem identical with the Messiah. This does not fit. Here the prophet announces to King Ahaz of Judah that his own (Isaiah's) son will prophetically foreshadow the doom of the neighboring kingdom of Israel (Isaiah 8:18). Yet embedded in these prophecies relating to Israel and Judah in the eighth century B.C. we find one of the great themes of all the prophecies — the Messiah, specifically Christ's birth to a young virgin (Isaiah 7:14). Isaiah's son, named Maher-Shalal-Hash-Baz (meaning, roughly, "the spoil speeds, the prey hastens"), by his very name testified to Israel's imminent defeat at the hands of Assyria in 721 B.C. So we have two births, two sons, two themes occurring in the same prophetic chapters. Blended here also are prophetic references to Christ's rejection by His own people (Isaiah 8:14), Christ's disciples and the preservation and perpetuation of the canon (verse 16). Yet Matthew 1:23 is sure proof that Isaiah 7:14, the passage about "Immanuel," refers directly to Christ's birth, not the birth of Isaiah's son. The blending of major and minor themes here has masked, to a certain extent, the prophecy of Christ's birth to a virgin. Illogical? No. This approach is "plain to him who understands, and right to those who find knowledge" (Proverbs 8:9). Psalm 111:10 tells us that those who keep God's commandments will have a "good understanding." That is precisely where most people err. Not approaching the prophecies prayerfully, carefully and humbly — seeking to act on the knowledge revealed — totally short circuits most people's understanding. One major reason God inspired these subtle but skillful techniques in prophecy was to ensure that a right attitude would have to precede understanding (Matthew 18:3-4). The childlike willingness to act on revealed truth is one of the first rules of effective Bible study. Unless the willingness to obey is there, the prophecies will remain a mystery (Isaiah 29:11). God's dynamic inspiration of His writers often flowed into creative, artistic channels. These devices enhanced the value of His Word as literature, yet also helped cloak the true message to those who had not been called to understand it. "Therefore, behold, I will again do a marvelous work among this people, a marvelous work and a wonder; for the wisdom of their wise men shall perish, and the understanding of their prudent men shall be hidden" (verse 14). Yet, paradoxically, we who have been given the precious gift of understanding these truths (Daniel 12:10, Proverbs 1:7) can marvel at the variety and diversity in God's revelation to us. Bible prophecy is replete with treasures that God wants His chosen people to dig out and examine (Proverbs 2:1-5). Surely David's exultant cry should be ours: "I rejoice at Your word as one who finds great treasure" (Psalm 119:162).